Composer Gian Carlo Menotti, who died earlier this year at the age of 95, was celebrated for much of his life as the spirited creator of entertainingly accessible American operas, winning numerous awards, including two Pulitzers (for 1951's The Consul and 1955's The Saint of Bleeker Street), along the way. As a young composer, he enthusiastically embraced the emerging technologies of radio and television, writing the first operas ever created for those forms of media. His most famous opera, the Christmas-themed Amahl and the Night Visitors, was created for television and first broadcast as a live holiday special on NBC in 1951. For all his success, however, Menotti—born in Italy but raised in America—never won the hearts of the classical-music critics in his adopted country, where his works were viewed by the critical press as coarse, oversentimental and mawkishly cautious. To make matters worse, after a few initial compositions written in Italian, all of Menotti's major libretti were written in English, which won him American audiences but lost the favor of the traditionalists. "Basically, Menotti was too popular," says Elly Lichenstein, executive director of Cinnabar Theater in Petaluma and director of The Consul, which opened Oct. 19 in conjunction with the countywide Performance Sonoma slate. "His music and the stories he told were designed to bring people to opera who had never been interested, and the purists thought this would only bring the art form down. And he wrote for Broadway, which was the worst crime of all from the point of view of musical classicists, who felt that opera was about inspiration and art, whereas musical theater was just vulgar and commercial." Menotti won some brownie points for founding and directing the annual Festival dei Due Mondi ("The Festival of Two Worlds"), held since 1958 in Spoleto, Italy, with its companion event, the Spoleto Festival, held in Charleston, N.C. Massive, multidisciplinary arts celebrations, the Spoleto fests feature all manner of concerts, opera, dance recitals, theatrical performances and visual-art displays, along with forums and roundtable discussions on music, the arts and science. "The Festival of Two Worlds was designed by Menotti to make opera and classical music something that the average person could approach and get something from," Lichenstein explains. "That was his goal, to bring this art form, not down to a lower level, but out to a broader audience, out to the people who had always believed opera was too difficult or too complicated." One could say the same thing about the intimate 90-seat Cinnabar Theater, founded in 1970 by the late Martin Klebe, who once performed at the Festival of Two Worlds, as a place where opera could be made available and accessible to nonclassical audiences. 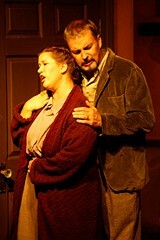 Over the years, Cinnabar has performed several of Menotti's operas, a tradition that continues with the current production. The Consul is a rich, riveting political thriller about the residents of an unspecified fascist country who are desperately awaiting papers to escape to freedom. The primary focus is Magda (Kristen Brown), wading through a nightmare of red tape and secret police dealings as she tries to win an exit visa before her freedom-fighting husband, John (William Neeley), who is in hiding at the border, is forced to return for her, thus putting his own life in peril. Much of the action takes place at the consulate, where an assortment of foreigners and oddballs also wait for exit papers. The music is alternately eerie and hopeful, with touches of fantasy that suggest a Twilight Zone alternate reality. "It's typical Menotti," says Lichenstein, "in that it takes a subject that doesn't seem like the stuff of typical opera, and tells that story using music that is beautiful and emotionally gripping. Menotti composed with the expectation that his works would appear in opera halls or on the Broadway stage, but he works very well in small houses like Cinnabar. I would say that in the case of The Consul, which takes place in offices and small apartments, Cinnabar is the perfect place to see this show." 'The Consul' runs Friday–Saturday through Nov. 10; no show Nov. 3. Oct. 26–27 and Nov. 2 and 9–10 at 8pm; Nov. 4 at 2pm. In conjunction with Performance Sonoma. Cinnabar Theater, 3333 Petaluma Blvd. N., Petaluma. $32–$35. 707.763.8920.